Waking up in sunny Goa, are we? Then, you must have breakfast on your mind. And why not? Goa does breakfast with a bang. Cafes, bakeries, restaurants and shacks of course, serve up a decadent morning feast that includes everything from sausages and bacon to wheatgrass shots, fluffy omelettes, and hefty sandwiches. Here’s where you can sign up for a delicious breakfast in North Goa. This breezy cafe located right on the Arpora-Siolim Road is a hot pick with holidayers. Run by a German couple, the laidback ambience makes for a soothing start to the day (especially important if you are nursing a hangover). The food is one of the high points here. And you can tuck into plates of sausages and omelettes that come packed with everything from cheese to bacon. Don’t go away without trying their flaky, fresh from the oven croissants either. A Calangute legend, Infantaria may now be a restaurant but started off as the town’s most popular bakery. However, thankfully, you can still tuck into their baked goodies for breakfast. Simple, no-frill sandwiches and downy croissants are the best picks from their display cases. Their beef burger and cheese omelette are top-notch. They make a great cuppa as well. Do pack some of their tea cakes and puffs to munch on the road. A delightful garden cafe set in an old Portuguese house, Artjuna takes after its name — the whole space has a very artsy, relaxed vibe about it. 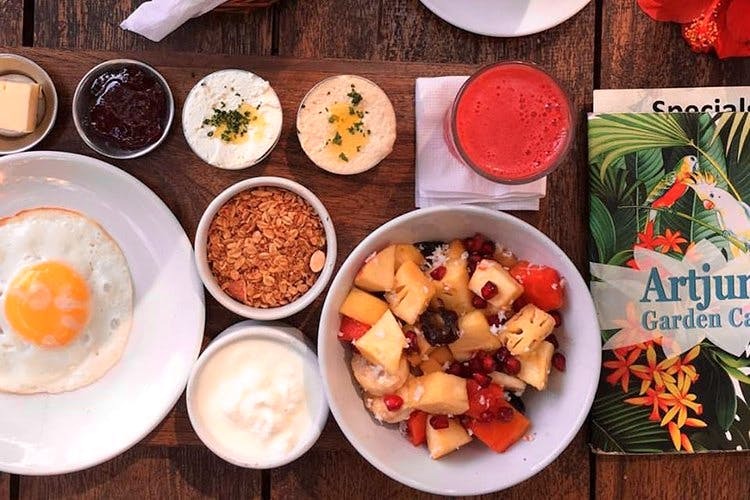 Refreshing fresh juices of both fruits and seasonal veggies sourced locally, healthy and delicious middle eastern food, and an all-day breakfast menu alongside a lifestyle store, a huge multilingual collection of books and some of the best coffee you will find in town, puts it amongst our absolute favourite breakfast spots. If you are in Candolim, Cafe Chocolatti is the place to go for a top-notch brekkie. They offer a few all-day breakfast options. And these include a classic English breakfast, waffles, and croissants. Their filling Panini sandwiches will also ensure that you stay energised well into the day. The BLT, Goan Chorizo, and Cheddar and Mango Chutney are popular picks. Of course, if you think breakfast is the perfect time to tuck into dessert, don’t miss their banoffee pie or the carrot cake. Housed inside Hotel Fidalgo, Aunty Maria is a neat little coffee shop that serves up quite a few options during breakfast time. Drop by for mouthfuls of their fluffy omelettes (made with three eggs or whites). The Turbo Omelette comes speckled with grilled chicken, baby spinach and fresh mozzarella. There’s also the Super Combo, that’s packed with mushrooms, bacon, tomatoes and mozzarella. Apart from waffles and pancakes, they also serve up sandwiches that come in desi flavours like chicken tikka and veg seekh kebab. An all-day breakfast place, Kenny’s is run by a Goan couple. Patrons swear by their stellar English Breakfast that includes all the classic components — sausages, eggs, baked beans etc. The airy pancakes too are a huge hit with the crowds. These stacks of happiness come topped with strawberries, blueberries, chocolate sauce and the works. If you won’t settle for anything lesser than a breakfast buffet, then, book a table at Cotinga. Part of The Tamarind hotel in Anjuna, Cotinga offers a well-priced breakfast buffet through the week. You can nibble on fresh breads, omelettes just off the tawa and sip on fresh juice. Their Grilled Chicken Sandwich and BLT version make for light eating. Do end the meal on a sweet note with their highly-recommended strawberry shortbread. Craving puttu for breakfast? We got you covered! South Indian breakfast like no other, Gunpowder maintains its characteristic charm even in its breakfast menu. One of Gunpowder’s best-kept secrets, the idiyappam and the puttu literally melt in your mouth, leaving you craving more. Head here before the crowds start to pour in for lunch and enjoy a slow and hearty breakfast, seated in the middle of a lush garden under a canopy of huge upcycled flowers, and breathe in the slow life, that is Goa. A hidden gem of a cafe that almost convinces you that you’re in the hills, Mojigao has some of the best coffee in town. The cafe has refreshing fresh juices, as well as a delicious homemade cheese platter. Surrounded by giant trees, chirping birds and a large open space where you can relax with your sandwiches or a plate of hummus and homemade pita, Mojigao despite being one of the newer spaces easily is amongst the best breakfast joints in North Goa. With a bookshelf housing books by Murakami, Wodehouse along with Hardy Boys, all one needs is a cup of cortado and all the time in the world. Set inside Sunaparanta Centre for Arts' beautiful courtyard, this one is a no-brainer. Start your day exploring Panjim after a hearty breakfast of eggs, bagels and smoothies here. Bodega is a popular hangout and starts to fill up early as everyone-in-the-know gets friends and fam here for waffles, coffee and sandwiches. They've got pizzas, so if your brekkie is running into brunch, get yourself one with the side of fries (because, why not?). Be warned though, that a massive breakfast later and with the gentle morning breeze, you might be lulled into siesta.